Investors! Swing Traders! Day Traders! Are you getting results like this? Profit from high market volatility with the E-Zone Trading System! - - - or like this? If top of Exit Zone is <= yesterday's top, and today's Open is in or above Exit Zone, SELL - - - Target is bottom of the Exit Zone. If bottom of Entry Zone is >= yesterday's bottom, and today's Open is in or below Entry Zone, BUY - - - Target is top of the Entry Zone. Entry value is considered the Open value. Exit all trades on Close if Target or Stop is not hit. To protect against severe drops a 6.5% stop is used. On BUY, invest all dollars to nearest full share. Balance stays in Money market. Hold position until Sell signal. On SELL, put all dollars into Money market. Entry and Exit values are at the Opening price. Using same rules as above, go long on 1st BUY, short on 1st SELL. No stops or targets are used in either Compounding or Fixed, though experienced investors and traders will set their own risk comfort levels. Can you afford to wait 44 months to recover your losses? On Dec. 24, 2007 the S&P 500 was 149.33. In almost 4 years it has never been higher. 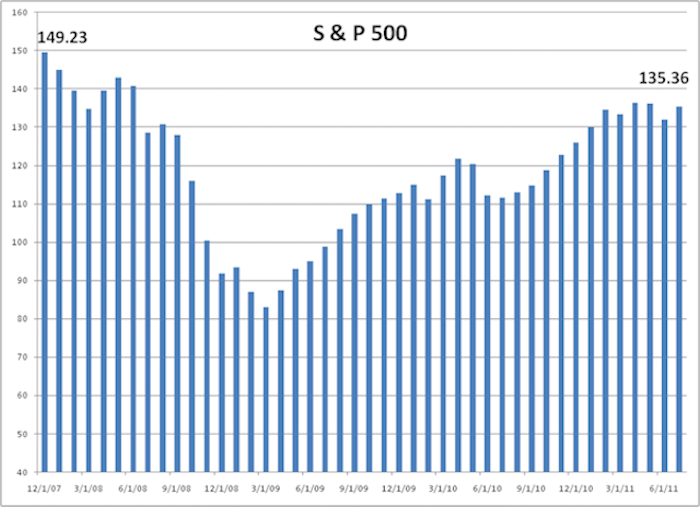 On July 7, 2011 the S&P 500 stood at 135.36, and it is creeping lower. To understand why a "Buy and Hold" strategy can do so much damage to your portfolio, examine the charts above. Can you afford to wait 4 or 5, or even the 8 years it might take to recover from a 50% loss? Give yourself a better stock market trading strategy than "buy & hold"
Get a 21st century trading tool. This is a series of 21st century algorithms that have been in use for over 10 years, serving investors and traders worldwide. 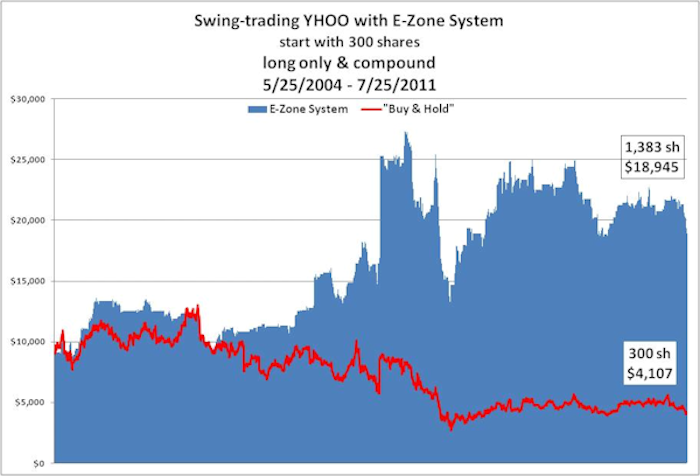 Use the E-Zone System for swing trading, day trading, and long term investing. After the market close, stock timing and trading signals show you the next day Entry and Exit Zones.